Easily one of the cutest and coolest looks of the year, the Speedo Aqua Queen Toddler Girls’ Short Sleeve Suntop in Aqua Queen and Sweet Mint. 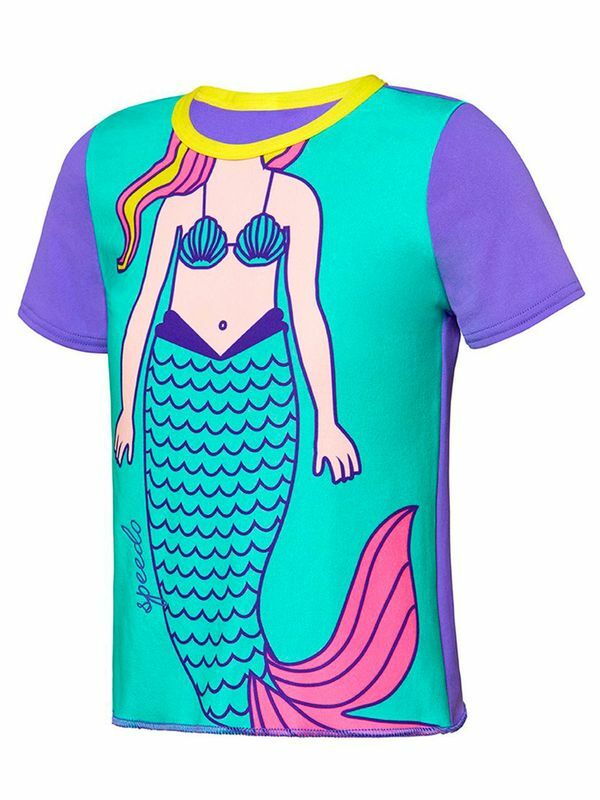 This jade top features an adorable mermaid with ginger locks, along with vibrant violet accent sleeves. When your little lady see this, she won’t be able to wait through to pop her head through this fab look. The best selling swimwear brand in the world, Speedo is sold in more than 170 countries around the planet. With adorable looks like the Speedo Aqua Queen Toddler Girls’ Short Sleeve Suntop in Aqua Queen and Sweet Mint, it is easy to see why Speedo is so popular! Aqua Queen Toddler Girls Sun Top manufactured by Speedo Swimwear the worlds leading swimwear brand. Speedo is passionate about life in and around the water, creating revolutionary new technologies, designs and innovations.